The Best Whole Home Pressure Washing Company in Mobile, AL! House washing, or pressure washing, is cleaning the outside of your home, including the driveway and sidewalks. Over time, concrete gets a dingy appearance, green spots appear in shaded places on your home’s exterior and doors and windows gradually become dirtier and dirtier. That’s where pressure washing comes in. We bring our own equipment, plug into your water and electricity and go to town cleaning the outside of your home. High pressure water is sprayed to clean years of gunk build up off, and leave your home looking like new again. Pressure washing is harder than it sounds. Different materials demand different pressures, or different amounts of time or distance to ensure there is no damage. I have seen homes with fragile Old St. Louis brick on the exterior where a pressure washer took a layer of brick! That isn’t cool. Even harder is painted concrete! I’ve seen houses where paint has been stripped away in chucks, leaving the concrete looking worse than before the pressure washers arrived. Thinking About Selling Your Home? Get it Washed First! That ain’t how we work. 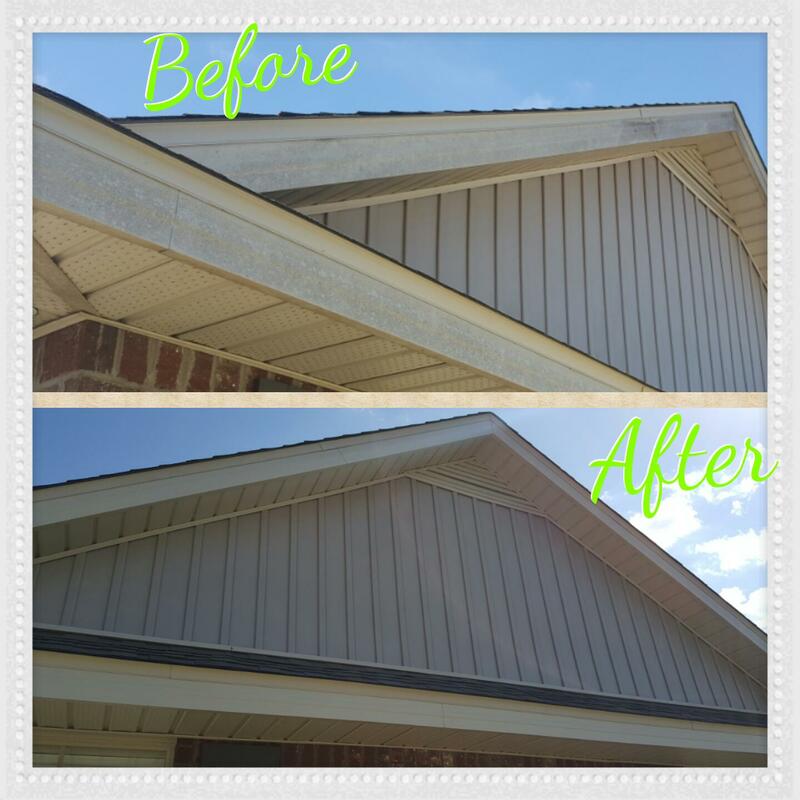 We leave your home looking better and cleaner after pressure washing it! Check out that before and after photo to see what I mean. I promise that's only after pressure washing. I didn't repaint the house and trim just to get a good photo. A popular option for our pressure washing clients is to sign up for our annual program. We come by once each year and give your home a once-over. That keeps it looking fresh and new all year around. Plus, it ensures that mold growth isn’t rampant and can help to improve the longevity of your house’s exterior, especially in this Mobile, Alabama climate we live in. Another option is to have your whole house washed before listing the property. Curb appeal makes a huge difference to the interest buyers show in your home. A dingy, moldy, exterior is not the first impression you want to make! We have you covered. Don’t let buyers come to your home and peer out of mold-covered windows to appreciate the view out to your backyard. Give us a call today if you have any questions about pressure washing your home. I can talk your ear off about whole home washing if that's what you're after. Alternatively, we'll keep it short and sweet and schedule a time so I can come out and give you a free estimate. Ed and Lesleigh with Nurse's Touch were very polite and prompt. They did an excellent amazing job. I would recommend them to family and friends.